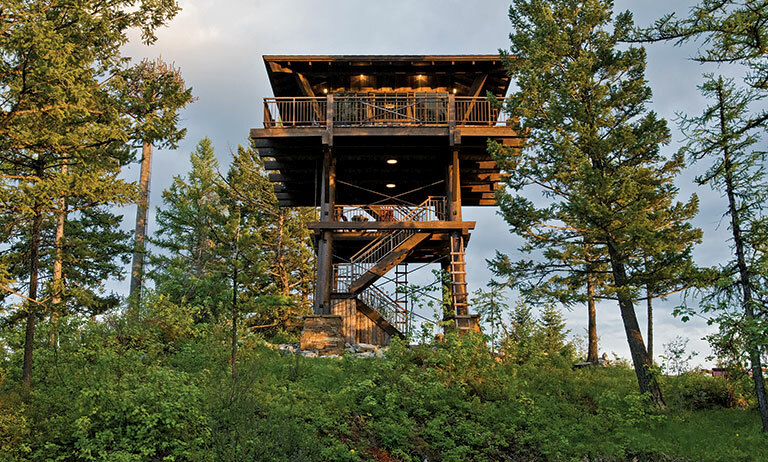 A city-dwelling family escapes their concrete confines for something wild—a fire tower in western Montana. For some, having a mountaintop experience is a figure of speech, but to Bick and Bonnie Smith, it’s a way of life. Years of climbing the corporate ladder in Minneapolis left the couple longing for a change of scenery. 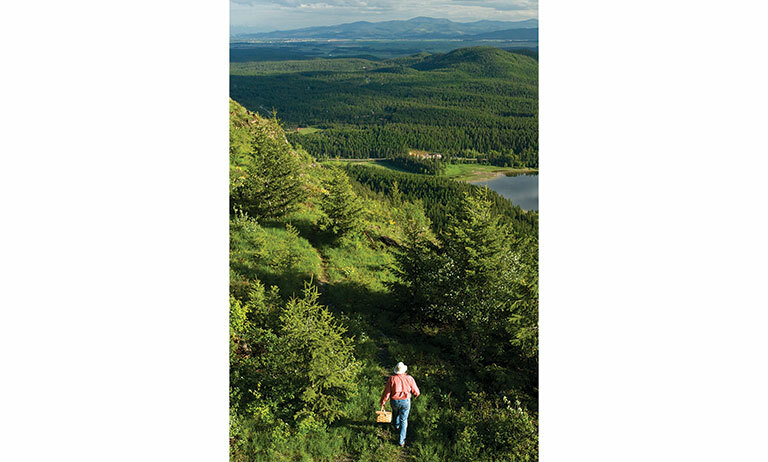 So 10 years ago, they traded their big-city views for the wide-open spaces of western Montana. Now, the adventurous pair and their teenage son, Bentley, are still moving up in the world—geographically speaking—thanks to their lookout tower. 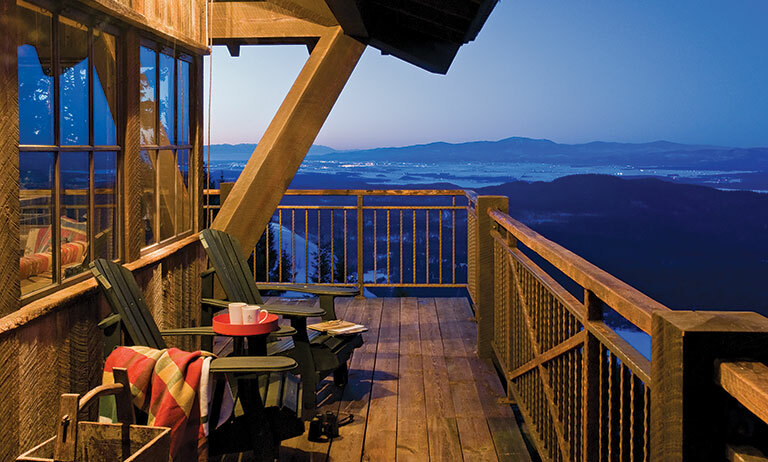 Perched on a mountain overlooking a tree-studded valley, the 35-foot-high, single-room tower completed last summer offers breathtaking vistas of glassy waters, twinkling lights and, of course, miles of blue sky. 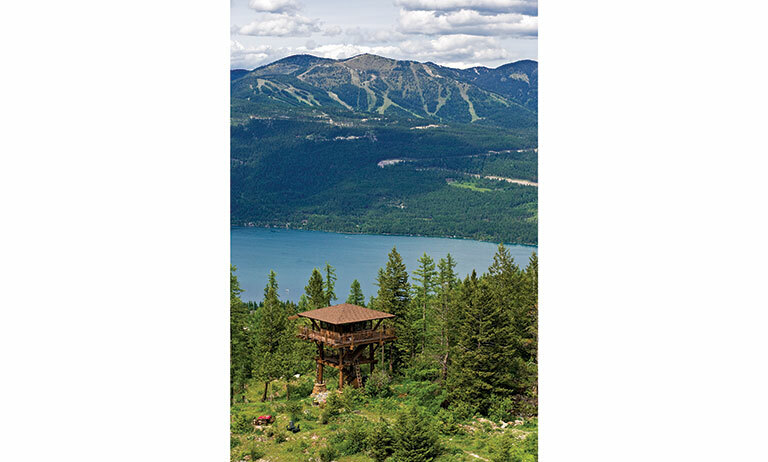 “Up in the tower, it’s nothing but view,” says Bick, who began dreaming of the tower and its location long before the first timber was raised. “I visited the area in college and said, ‘If I ever live here, I want it to be on that mountain,’” Bick recalls. After moving to Montana, the couple purchased the 10 acres he’d seen (just minutes from their home) and began planning a cozy, functional space where they could take in the landscape that lured them westward. 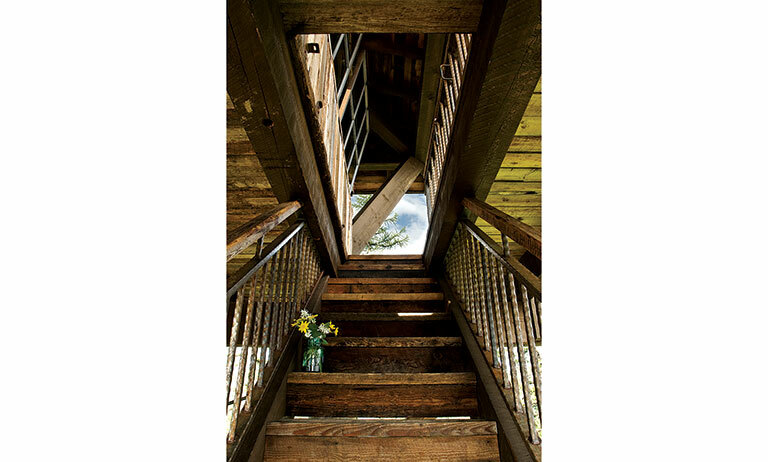 To turn their ideas into a smart design, the couple worked with architect Scott Elden and Mike Koness, owner of Centennial Timber Frames. “We chose people who would bring something to the party,” explains Bick. Mike says the project was so unusual that he jumped on board without hesitation. For a guaranteed connection with the outdoors, walls change to windows at waist height and the windows tilt out to usher in cool breezes. Inside, the interiors defer to the views with simple furnishings and muted tones. A refrigerator, microwave and propane stove make the area functional for weekend stays, while a home theater system with a big screen television and an X-box boosts the entertainment factor. “We didn’t plan on having any of those things, but we wanted as many excuses as possible to go up there,” Bick says. But the tower isn’t just for fun. The forest service uses it as a lookout during fire season, and the Smith’s allow community groups to hold meetings there. They’ve even auctioned off a night in the tower for charity. “We know how lucky we are, and we want to share it with others,” says Bick. Often, the sharing comes in the form of the Smith’s frequent dinner parties. While the 200-square-foot room seats about a dozen guests, it’s the 6-foot-wide wrap-around catwalk and second-story deck that set the stage for entertaining. 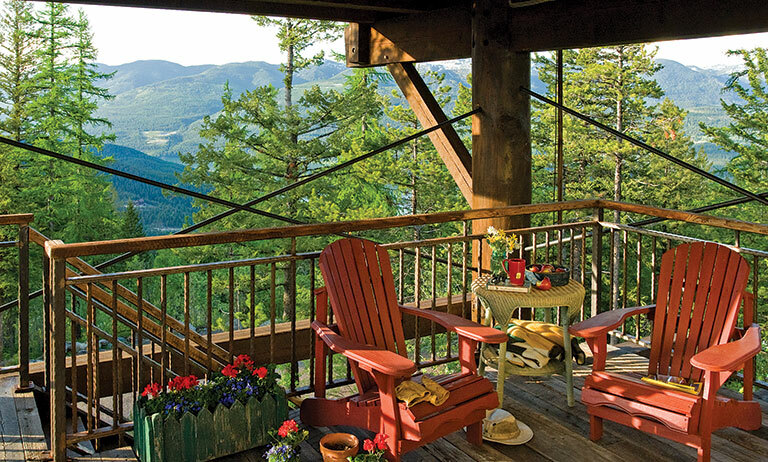 When not hosting family and friends, the couple says they love to curl up with a book, watch for wildlife (they often spot mountain lions, eagles and even the occasional bear) or just relax with a glass of wine during sunset. “It really is like watching over paradise,” says Bonnie. “You can see for 70 miles on a good day, reaching all the way into Canada,” says Bick. But some of the best views are nearby. A thermal current just off the cliff carries eagles and ospreys. “It’s the coolest thing to watch,” says Bonnie. 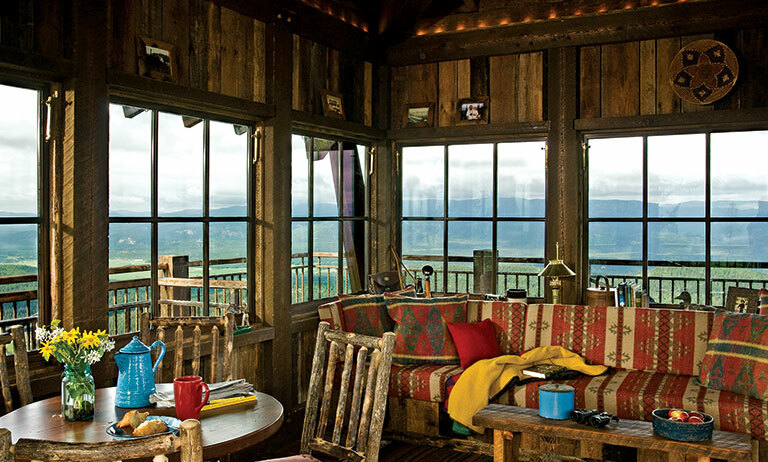 “There are two types of people in the world: perchers and nesters,” says lookout tower owner Bick Smith. 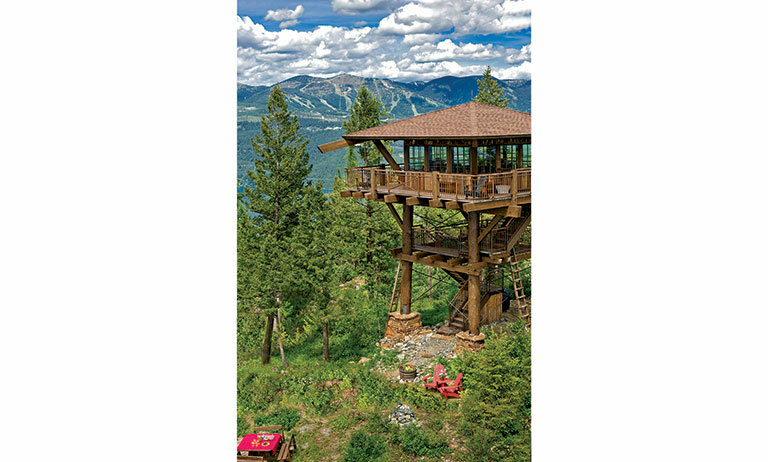 The tower is perched on a 1,400-foot mountain ridge and rises three stories above the ground. For smart storage and seating, the Smiths opted for built-in cabinets (not shown) and a sofa with a pull-out bed. 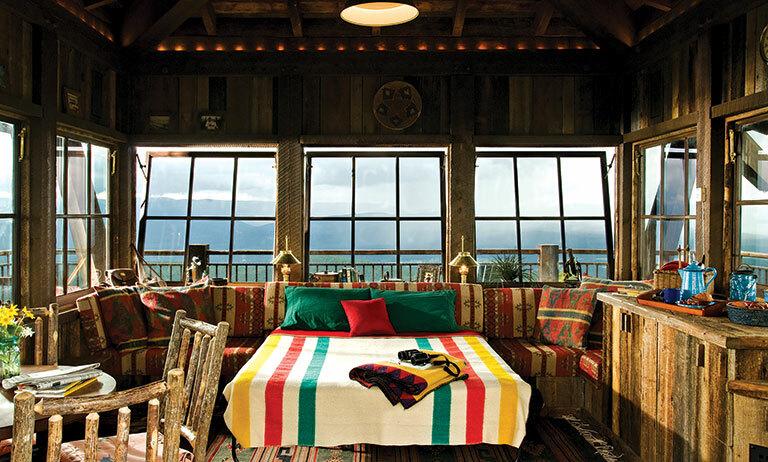 For an informal, relaxed look, Bonnie Smith says they furnished and decorated the cabin with pieces they already owned, like Bick’s childhood cookie jar and a pair of snowshoes from his grandfather. Mini-track lighting installed around the ceiling gives the wood a warm glow at night. A sleeper-sofa saves space and catches a mountain breeze from tilt-open windows. To make the trek upstairs easier for their two golden retrievers, Jasper and Bear, the Smith’s opted for stairs with closed backs for a more canine-friendly climb. The mid-level, open-air deck is Bonnie’s favorite spot for dinner parties or sharing cocktails with friends. To cut down on the deck’s maintenance, the Smiths covered it with 100-year-old reclaimed barn wood. The couple also stained the timbers gray. Extra-long overhangs atop the catwalk ensure that family and guests can enjoy the deck, rain or shine. towers in some of the most pristine and drool-worthy spots in North America. You can rent towers for a night or more in California, Idaho, Montana, Oregon, South Dakota, Washington and Wyoming. The fees are nominal, and some towers are so remote you have to trek to them a mile or more. But for these views, it’s worth it.